A fun, potentially useful little instrument, and building it yourself adds to the experience. Not an essential purchase though. Building the instrument yourself is easy - and fun! CraftApp makes importing samples and editing sounds easy. The sound is pretty lo-fi. Shared Tap Tempo/Shift button is awkward. Feels a little flimsy once built. The CraftRhythm is a compact digital drum machine from Bristol-based Modal electronics. It follows on from the company’s CraftSynth, which arrived back in 2016. 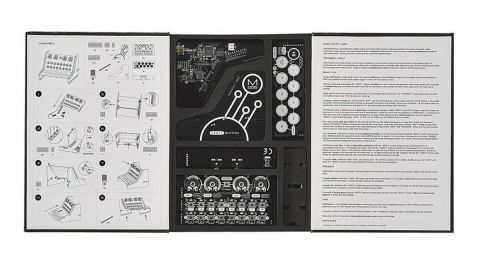 Like its predecessor, the Rhythm comes in the form of a flat-packed, snap-together kit that, once assembled, forms a small, lightweight instrument shaped a bit like a miniature mixing desk. Assembly is easy - simply slide the parts together and use the supplied connectors to join the electronic components together. The connectors are what hold the Rhythm together. They feel sturdy enough once installed, but since there are considerably more connections to make along the left hand side than the right, the completed instrument ends up feeling a little loose and flimsy down one side. Power comes via a mini-USB connector, which can be set up to receive an input from either a USB connection or compatible battery pack. This is joined on the rear of the unit by a pair of mini-jack ports for headphone and line outputs. The Rhythm is an eight-track sample-based drum machine. It has a total of 64 sample slots, arranged into eight kits, which share a total of 15MB of memory. These slots come fully stocked with a selection of factory sounds, but users can import their own samples to replace any of these via Modal’s CraftApp, which can be accessed on desktop, iOS and Android. The sample engine itself is 16-bit with a sample rate of 44.1kHz, and sounds rather lo-fi and noisy, but this isn’t necessarily a bad thing in the right context. The Rhythm features three warp modes for samples: Speed, altering the rate of sample playback; Stretch, which can time stretch a sample across the 16-step sequencer grid; and Shift, which can adjust the pitch of a sample without changing its length. Each track also gets a resonant low-pass filter - which tends to distort quite easily - along with AHD envelopes that can be applied to the filter cutoff, amp level or pitch (when in Shift mode). Rhythm’s interface can feel a little convoluted, due to cramming quite a lot of functionality into a compact space, but it’s not too bad to use once you get your head around all the necessary shift-presses. There are a couple of odd design choices though, such as having the Shift button double up as a tap tempo, which makes it far too easy to accidentally make BPM changes. The CraftApp makes tweaking, programming and sequencing much simpler with a better interface and more visual feedback, but it does beg the question: if you’re going to control a digital sampler using a computer or iOS device, why not cut out the hardware and just use a sampler app or plugin? That being said, the Rhythm is fun to mess about with and can inspire some nice, gritty little drum patterns. It exists in the same realm as Teenage Engineering’s Pocket Operator range, but with USB MIDI, a dedicated line-out and the app compatibility, it’s considerably more studio friendly. By comparison though, qw miss the PO’s great punch-in effects, and without a built-in battery connection, the Rhythm can’t claim true portability despite its compact size.